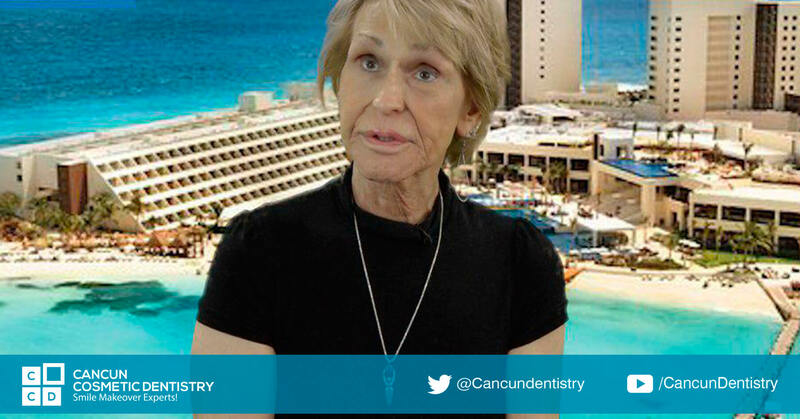 “I recommend this place very highly” Cancun Cosmetic Dentistry Reviews! We know how important are reviews about our services for you and any other patient thinking on coming to Cancun to get their dental work done. We offer the most affordable rates with no hidden fees and the most professional staff that will make you feel like you are visiting family! You won’t find this level of care and attention to detail in USA for the price. Enjoy the first class dental care you deserve! I just want to mention to people who might be thinking about dental work or hesitant about leaving the United States to come to Cancun for their dentistry. I can honestly say to you I never had one ounce of pain. I never felt any pain. So I recommend this place very highly to anybody who wants to be here. There was never a minute here that I ever felt uncomfortable. Every time I came here I’ve been welcomed, I’ve been honored and I just feel like the most important person here. To me is my dentist of choice. Yes, I know is a long trip for a lot of people, but I’ve met people here from Canada, I met a lady here from the Asian sector. People fly from all over the world to come here! There has to be a reason! Have a little fun in Cancun, and I gotta tell you, this is a great place to have fun. For me this is the place to come. That’s how I feel about it. How strongly I feel about this place. If you want to watch more you can go to our Youtube channel where hundreds of patients have made video testimonials their experience at our dental clinic. You can also check more Cancun Cosmetic Dentistry Reviews here. Cancun Cosmetic Dentistry just won the Patient Service Award from WhatClinic! Doctor German Arzate just became a TOP DOCTOR at RealSelf! A link between periodontitis and Alzheimer's?